Zgodba se odvija konec 19. stoletja na ameriškem divjem zahodu. 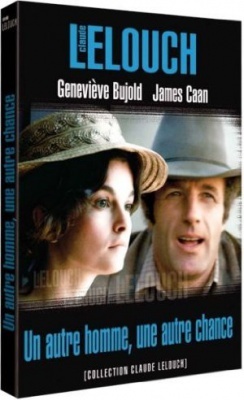 Ovdoveli veterinar David (James Caan) ter vdova Jeanne (Geneviève Bujold) se po tistem, ko sta izgubila svoja zakonca, potihem in previdno zaljubita.Francija leta 1970: Napoleon III. je pravkar izgubil vojno proti Prusiji in svojo deželo pustil v razsulu ter revščini. Mlada Jeanne (Geneviève Bujold) se zaljubi v fotografa Francisa (Francis Huster) in ta jo vzame s seboj, ko se izseli v Združene države Amerike. V mestecu na ameriškem divjem zahodu odpreta majhno fotografsko trgovino. Medtem tudi veterinar David (James Caan) s soprogo živi na odmaknjeni kmetiji. Po dveh letih in dveh tragičnih nesrečah, ki jima odvzameta ljubljeni osebi, se Jeanne in David naposled srečata. Jeanne, ki je ostala sama z otrokom, se je odločila vrniti v Francijo in se že pripravlja na odhod – a nepričakovano, prav potihem in previdno se z Davidom še v drugo zaljubita. V njuni življenji se vrne upanje. A photographer, who has been hired to photograph the wild west of America where he has lived his entire life, tells his client of a photograph he has that was taken one hundred years ago by his French great-grandmother that epitomizes what he is trying to capture. The story behind the photographer's heritage and that photograph... In the early 1870s, photographer Francis Leroy and who would eventually becomes his wife, Jeanne Leroy née Perriere, a baker's daughter and an aspiring photographer in her own right, move from Paris, where strife has taken hold due to Napoleon's loss in the Franco-Prussian War, to the American west, where the light is more conducive for their photography work. The move is despite not knowing about life at their destination and not knowing how to speak English. Veterinarian David Williams and his wife Mary Williams love each other, but their wants in life are incompatible with each other, David who loves his work treating real animals on farms and ranches, while Mary would rather live in Philadelphia where she was raised, especially as she feels isolated more often than not being alone on their remote farm. Several years later after both Francis and Mary are tragically killed in separate incidents, Jeanne and David meet for the first time as they both drop their respective children off at the same boarding school run by its unconventional teacher, Alice. Despite Jeanne and David's attraction to each other, a second chance at love for both may be impeded by the memories of their respective first spouse, for David especially as Mary's murderers were never caught.